The February destination for My Kitchen My World was Vietnam and I decided to make something I've seen many times in photos but never tried or made myself, Vietnamese Spring Rolls. These have always intrigued me, and being a huge fan of egg rolls and traditional fried spring rolls, I was excited to try these fresh spring rolls. 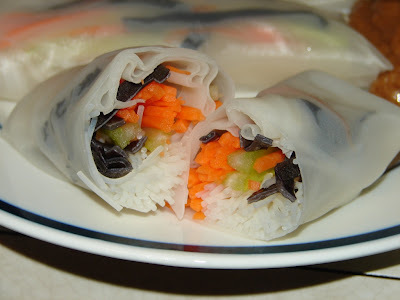 There are many recipes on food blogs and food sites for Vietnamese Spring Rolls, I looked at a lot and just decided to follow the style of the spring rolls and not go with a specific recipe. 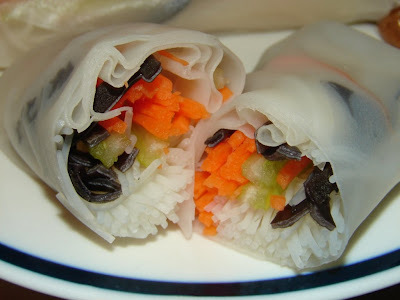 Mine were very basic in regards to the filling, using rice sticks (rice noodles, also called rice vermicelli, or mai fun) carrot, celery, and black wood ear mushrooms. Lots of the spring roll recipes I looked at also had a lettuce, sprouts, and some meat or protein. Next time I'm thinking of marinating some thin strips of tofu and baking them and using that for the filling. 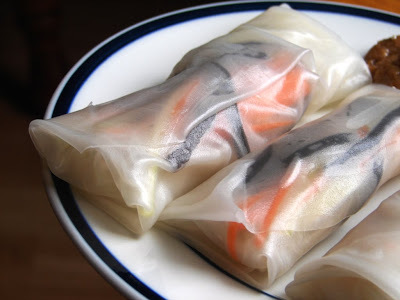 The kids had an amazing time "helping" me make these, what a combo of textures and flavors, and they were amazed at the rice paper wrappers and rick sticks softening in water. 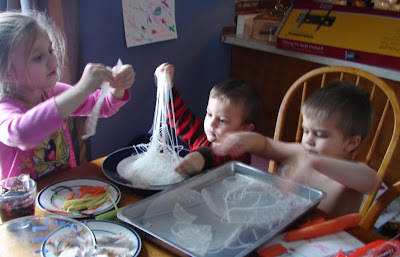 After I made a plate of spring rolls, I let them just play around with my extra ingredients, what a sensory experience!